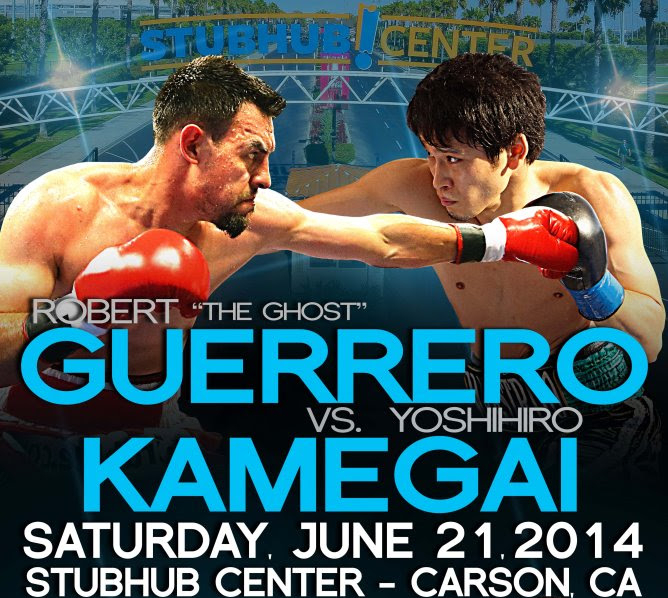 Golden Boy promotes Robert “The Ghost” Guerrero vs Yoshihiro Kamegai on June 21st in Carson, California from the Stub Hub Center. On paper, it’s a very good fight because both men like to slug it out and give the fans a show. So who will win and why? The more impressive resume belongs to “The Ghost” since he has fought and beaten Andre Berto, Michael Katsidis, Joel Casamayor, and Selcuk Aydin. Those are all men who were upper echelon fighters when Robert fought them and Guerrero came out on top against them all. Guerrero has a solid chin, he can box very well, and he can throw combinations very effectively. Also, his uppercut is thrown beautifully. These are all advantages for Guerrero. However, Yoshihiro Kamegai sports a (24-1, 21 KO’s) record, which is very impressive. His knockout percentage is very high and he is the taller, bigger fighter. Guerrero is not used to being the smaller fighter so this might be an advantage for Kamegai. The Japanaese star is also a slugger so he won’t be too hard to find when Guerrero decides to let his hands go. Since Robert Guerrero’s loss to Floyd Mayweather in May 2013, Guerrero has taken time off to just let his body heal and his mind heal. Robert became the first well known boxer to join the Crossfit movement, which explains his chiseled physique at the weigh ins. Although there is no shame in losing to pound for pound king, Floyd Mayweather, Robert Guerrero might not be ready psychologically to face as tough an opponent as Kamegai. Sometimes, boxers break down mentally after a defeat and that may just be the case with Guerrero. Is he still the same boxer he was when he faced Mayweather? Or is he damaged goods? Most boxing sites and people into betting boxing are predicting a Guerrero victory over Kamegai; they are picking Guerrero based on his resume. Although that is understandable, and we agree that Guerrero will most likely win a hard fought decision, Guerrero is still human and he just may not be the same fighter since his last fight was a loss to Floyd Mayweather. Will Guerrero really be better than ever in his return to title boxing? Or will Guerrero be on a rapid decline after a loss to Kamagai?